Houston, Texas Draws New Business Through Startup Companies. In 2010, Houston, Texas was named one of America's most entrepreneurially spirited cities. Each year hundreds of startup companies settle down in the "Bayou City" and add thousands of new jobs to the economy. Affordable living and housing costs, coupled with a highly educated and creative work force makes Houston an ideal place to start a thriving business. Distribution centers are widely popular startups because Houston's centralized location and world-class infrastructure provide the opportunity for accessible domestic and international trading. One of the most vital pieces of equipment in a distribution center is a warehouse forklift houston tx. If your startup company only operates indoors, 123Forklift recommends purchasing cushion tire forklifts houston. These forklifts carry lift capacities of 3,000-81,000 lbs and can reach heights over 16 feet. For outdoor applications, a pneumatic tire has the ability to move over rough terrain surfaces and carry large weight capacities. 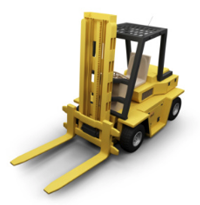 Depending on frequency of use, consider purchasing or renting a houston forklift. If the forklift will only be used a few times a year, a forklift rental houston may be the best option to save money and space in your warehouse. If you use the forklift more than once a month, the purchase of a used forklift houston is good investment. Forklifts for sale houston are easy to find with 123Forklift; we stock the largest inventory of all types of forklifts: sit down riders, rough terrains, order pickers, reach trucks, stackers, pallet jacks, telehandlers, and scissor lifts. Reliable tools and equipment are crucial for maintaining stamina of a working warehouse, especially within a startup company. Installing high shelves is the perfect solution for making efficient use of your space. Warehouses tend to expand upward instead of outward using material handling shelving when growing warehouses become too crowded. A warehouse forklift houston tx is designed to extend their forks up to 25 feet high and maintain large weight capacities. Companies use order pickers, stackers and reach trucks because the body of these forklifts houston are narrow enough to fit between tight aisles. A toyota forklift houston typically operates on high-performance and durable battery power. To learn more about the type of warehouse houston forklift you need for your startup, contact our sales department today at 877-326-2047. We can e-mail or fax you a quote detailing equipment specifications and pictures.